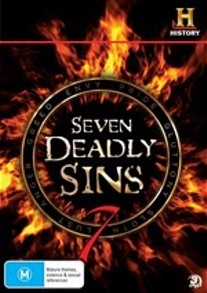 Seven Deadly Sins DVD Review I wanted to watch the whole thing, I really did but then when Gluttony didn’t have anything about Gorden Ramsy and the entire series avoids mention of the film “Seven” then I couldn’t make it. A man with a big deep authoritative voice tries to give a script full of clichés as much gravity as he possibly can whilst jobbing actors pantomime in front of a blue screen and computer animators push to create more CG for the background than Avatar. Such is the way of the current spate of documentaries created by America’s History Channel. This one “The Seven Deadly Sins” looks at the tradition and genesis of the most famous list of don’ts ever created. Stylistically, it’s overwrought and smacks of trying too hard. It desperately wants to wring every last scrap of drama out of what is already a fairly interesting tale and you feel a little like you’ve been trapped in a lift with a historian who’s done ten grams of speed. There is NOTHING that’s not interesting about this story and the bits that are not that interesting we are going to make interesting with the use of hyperbole and even more CG. A man writing at a desk has more angles and fly-bys than Luke blowing up the Death Star; I was dreading the point when we found this poor man’s exhaust port. The content of this documentary is in fact quite interesting. It’s just a shame that you have to wade through so much dross and repetition to get to it. They use some interesting experts who have clever things to say. Too often though, the makers have panicked and thought that animating (poorly, I might add) the dialogue will keep us interested. It doesn’t work. By the time you get to about episode 4 or 5 the pattern of each episode is rather grating. It certainly won’t stand up to re-watching. I wanted to watch the whole thing, I really did but then when Gluttony didn’t have anything about Gordon Ramsey and the entire series avoids mention of the film “Seven” then I couldn’t make it. Not even useful to use as a “How to” guide if you’re interested in sinning.